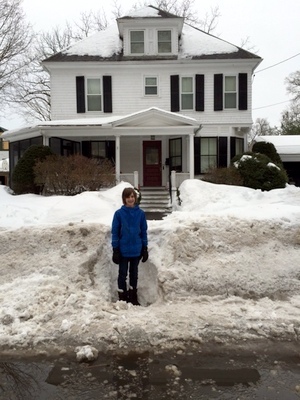 The very first thing to think about when Spring is just starting to spring is… drainage. On our lovely street, we have only two storm drains, located directly in front of our house. Our street is a gentle valley, not so much that you notice it when you walking down the street, but definitely enough to notice it when it’s raining and your storm drains are clogged up with leaves and there is an eight inch deep lake in front of your house. Because the city has basically no interest in maintaining said drains, it usually falls to us to trudge out there in the pouring rain and rake the leaves up off the drain so that we can get in and out of our driveway. 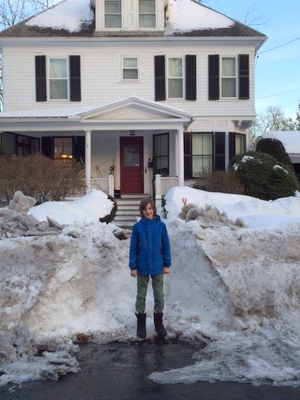 Note that Jake is standing in front of a three foot pile of packed, icy, dirty, plowed-up snow. Also note that there is no curb… not only could we not find the drain, but we suspect that the actual curb is at least a foot and a half back from where we were digging. Also note that we had hacked through about four inches of solid ice and still hadn’t reached the pavement. We gave up. So I called the city and left a message on the snow line, asking them to pretty please come dig out our drains before the next rain arrives. And lo and behold! They did. They must have brought a back-hoe. I brought Jake back out for comparison picture purposes. I can’t even imagine physically shoveling all that snow aside… thank you, thank you, dear public works employees for taking care of this for us! !